I’ve got a confession. 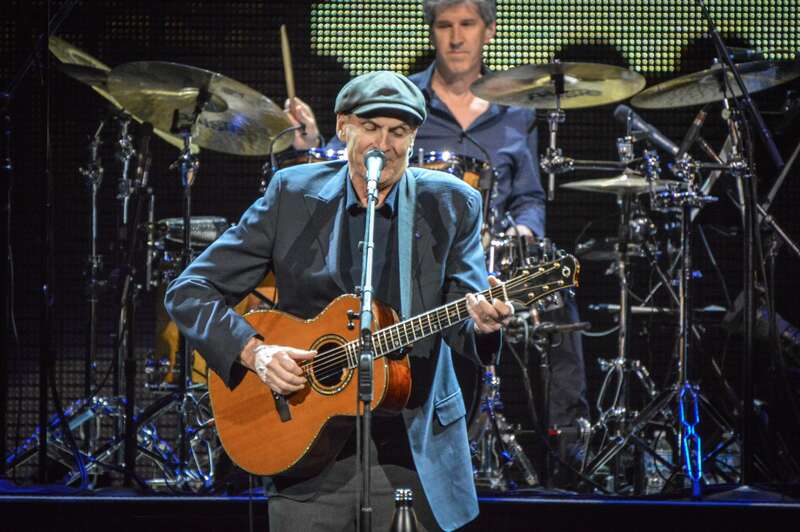 Before last night I’d never really listened to James Taylor. That’s not to say I’d hadn’t heard him, I could hum along to “Sweet Baby James” and “Carolina in Mind,” but I never knew who it was by. He’s just one of those artists that passed me by for no particular reason. That statement is a bit reductive but certainly not one that was wholly off the mark – in a good way. Before playing his own set, Taylor started off the show by sauntering out and lavishing praise on his old friend and the evening’s opener Bonnie Raitt. She didn’t disappoint. Dressed in what appeared to be the Reba collection from Dillard’s and sporting her signature red-to-silver locks in a pageant hairstyle, Raitt performed a rocking 45-minute set to start the evening. She played slide on multiple tracks, including a fiery versions of “Spit of Love” and “Something to Talk About,” and let her voice soar on “Unintended Consequence of Love.” The highlight though had to be her covers. The second song in her set was a bluesy version of INXS’ “Need You Tonight.” She performed an ominous cover of Skip James’ “Devil Got My Woman” that involved nothing but her, a spotlight, and a lot of eerie fingerpicking. The highlight though had to be her cover of the Talking Heads’ “Burning Down the House” which Raitt transformed from a funk-punk pop song into a full-on country rocker. The bar was set high by the time Taylor rolled on stage a little after nine. He knew the quality of what he had just witnessed and started off with a gorgeous rendition of “Carolina on My Mind” and followed that up with a bouncy version of “Country Road.” At this point, he had exhausted approximately 66.6% of his music that I was familiar with but that didn’t attract from my enjoyment of the show whatsoever. He performed a delicate, wistful version of “Don’t Let Me Be Lonely Tonight” as well as a song called Mexico which I gather was an early precursor to “Margaritaville.” Taylor even shredded on guitar during an early part of the set and pretended to fan his band members as they ripped through solos of their own. It should also be noted that the crowd was exceptional, not because they were particularly loud, but because most of them were far too old to be recording video or taking pictures throughout the concert. It’s something you don’t really know how much you miss it until it happens. It was an absolutely brilliant night of music and proof that you really don’t have to know what’s going on to enjoy a concert. As long as there’s talent on the stage, real talent, you’ll be just fine.